To put it simply-I love food. And, I knew backpacking for five months would make meal times interesting. Dehydrated meals do not have to be boring—creativity is key. Before diving into my recipes and concoctions, lets chat about the details of dehydrating. For starters, here are ten things to know about making DIY Dehydrated meals. 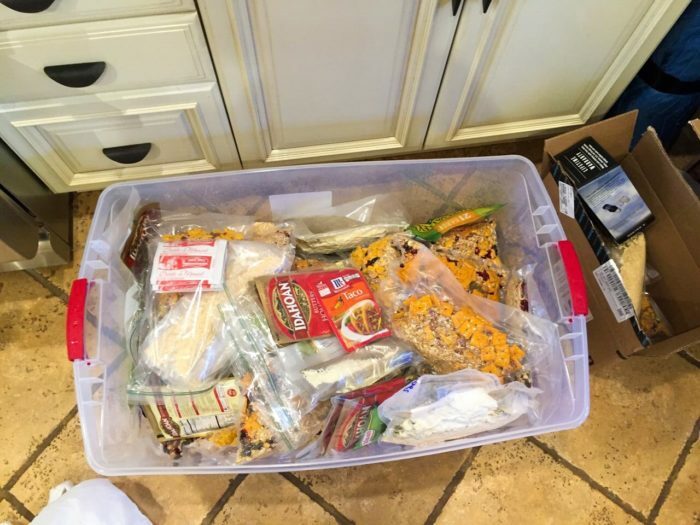 Knowing this, I decided to vacuum seal all my dehydrated food items for the trail. The Food Saver V3240 Vacuum Sealer served as a small investment to preserve hundreds of dollars of dehydrated food. I highly recommend vacuum sealing as I believe its the best method to prevents moisture from reentering the bag, which causes the food to spoil. Conversely, the food has to be completely dehydrated for vacuum sealing to work– if there is moisture or condensation, bacteria can grow. Depending on the food item, care has to be taken before, during and after drying. Typically, the water content of dehydrated food ranges from 5 to 20 percent. Here, it’s important to remember that preparation is unique to each food item. Thus, researching how to dehydrate a specific food item will provide greater detail. A general rule of thumb for dehydrating- if you eat it raw then there is no need to pre-cook the food before the drying. Vegetables like corn, broccoli and celery require blanching before dehydrating. Blanching is cooking the food item in boiling water then putting it in cold water. Further, the blanching step denatures enzymes that would impact the shelf-life and quality of the veggie. For vegetable specific dehydrating instructions, check out this step by step guide. If this all sounds too complicated, then dehydrating frozen vegetables may be for you! 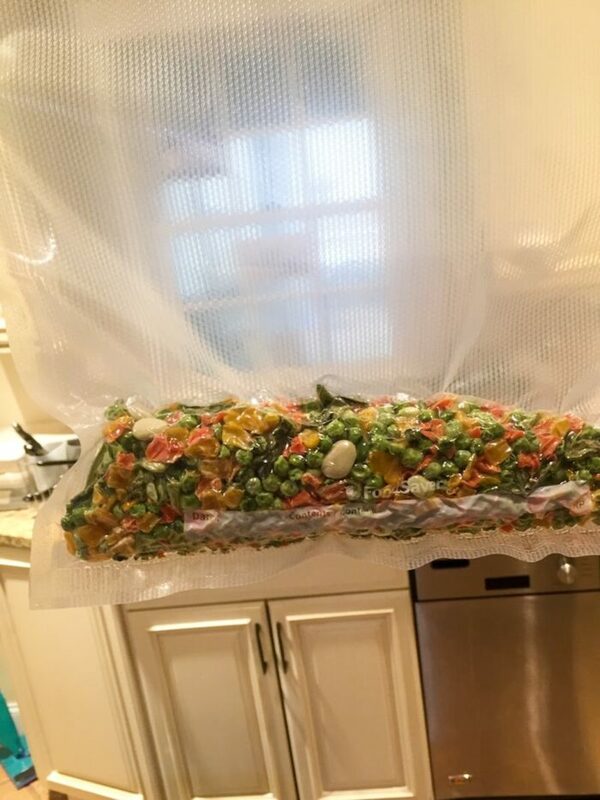 Frozen vegetables are already pre-cooked/blanked and ready to dehydrate as is. Have you thought about turning dried veggies into a powder? I found the product rehydrates better after it goes through a spin in the food processor but missed the texture of veggies. Just some food for thought. Before dehydrating, certain fruits like bananas and apples should be treated with a citrus wash to delay browning. As fruit varies, I recommend looking up food specific recipes to yield the best results. After drying, fruit’s moisture content should be around 20%. Because the fruit will dry unevenly (despite all your best efforts), it does requires an extra step before storing. Once the fruit cools completely and I mean totally cool, store in plastic bags or glass jars for 7-10 days, shaking daily. After this additional drying step, the fruit can be stored as is or ground up into a powder. In this time, condensation should not develop. If it does, too much moisture! So, back to the dehydrator it goes. Remember, water=bacteria=you getting sick or stuck with moldy food you just spent a lot of money on. Prior to the trail, I was a vegetarian. The smell of trail magic hot dogs and cheeseburgers tempted me up until Trail Days and out went my vegetarian ways. Therefore, I do not have any experience making home made Jerky. But, I do know making home made Jerky can pose the risk of harmful bacteria. The USDA Jerky and Food Safety Fact Sheet highlights how the bacteria in meat can survive the temperatures of a dehydrator (150-160°F) when cooked at a warm temperature for a long period of time. In order to minimize the risk of food born illnesses from E. coli 0157:H7 and Salmonella, meat and chicken needs to be pre-cooked respectively to 160°F and 165°F prior to dehydrating. This extra step destroys harmful bacteria from growing that would survive under a dehydrators temperature settings. Apparently, home made jerky’s shelf life is 1-2 months; whereas, store bought Jerky expiration dates vary from 8 months-1 year. 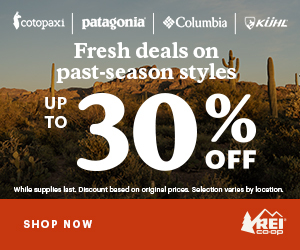 As a former vegetarian, beans were a great source of protein in my DIY backpacking meals. Beans can either be cooked (found in a can) or dried. I choose to buy bags of dried beans because its cheaper and used this helpful guide to drying cooked and dried beans . My personal favorite- dehydrated refried beans. Also, I grind my beans up into a food processor to make bean powder before storing. Avoid dehydrating foods high in fat like avocados, butter, milk and non-lean meats. The fat content causes the food to go rancid quickly and it’s better to consume the food as is. Personally, I choose not to dehydrate these but I’m sure a google search has the answers on how to DIY these. Instead, I buy them commercially. 10. 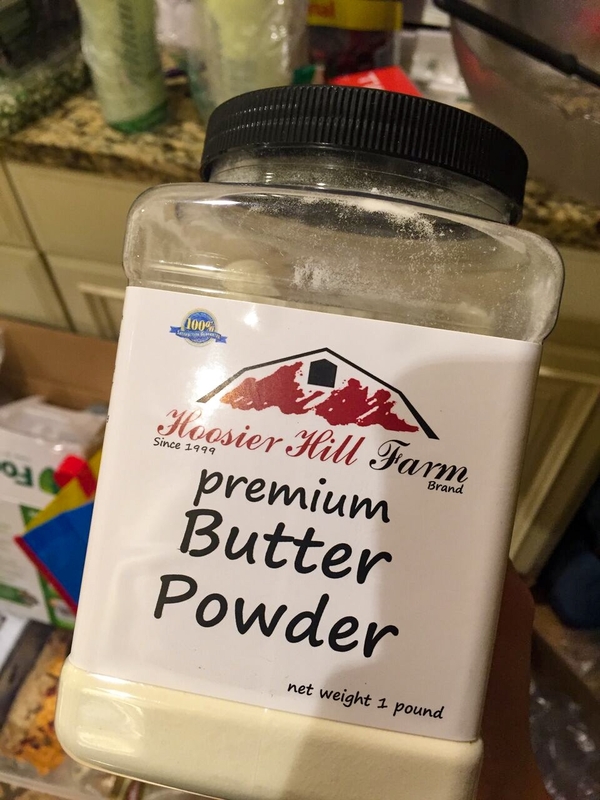 Butter, Cream, Mac and Cheese Powder! My favorite dehydrated food add-on items. Expensive, yes, worth it, definitely. There’s the core four in my delicious DIY meal kit. Most hikers carry olive oil to add to pasta sides or meals but let me tell you, this stuff is way better. I actually use the cheese powder at home for mac and cheese because it’s that good. On the trail, I’d pair the butter, cream, and Big Daddy Mac Mix with dehydrated quinoa, vegetables and beans. This meal was packed with nutrients and tasted amazing thanks to the delicious diary powders! I can say meals were more bland when we didn’t add in our cheese or butter pow. Plus-dehydrated butter is lighter than olive oil and 1 tsp has 100 calories and 10.3 grams of fat! 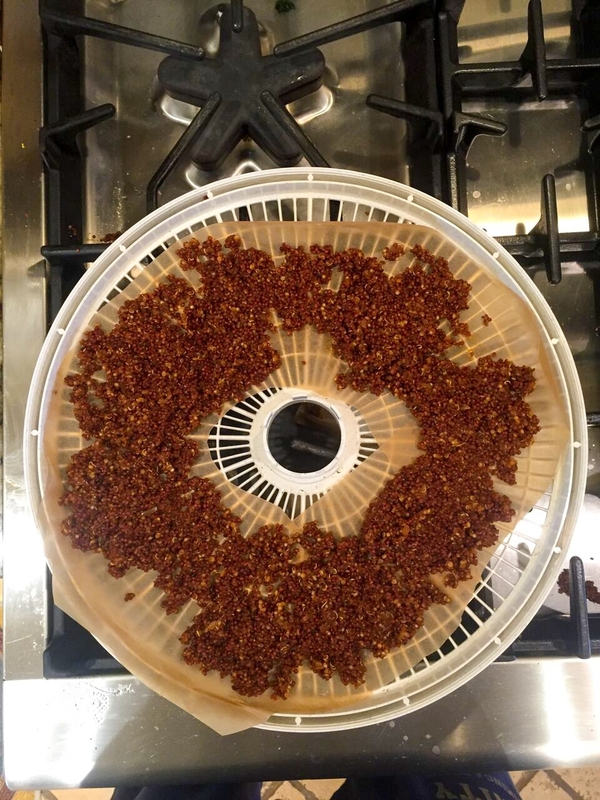 You have made it to the end of my Beginner’s Guide to DIY Dehydrating. I know, it’s overwhelming how much information there is for drying food. But, I hope this post makes understanding the basics of dehydrating, including food safety, easier. Certainly making your own dehydrating food can take time but I enjoy cooking and learning about food science, so it was enjoyable for me. As this is not the case for everyone, luckily there are some amazing dehydrated and freeze dried food companies out there. Explore your options and remember to taste test!